As you know that there are so many reasons that make OST email inaccessible and the user couldn't be able to move OST email with attachments into MS Outlook. OST file may be corrupted due to several reasons like; virus attack, power failure, unreachable networks, orphaned OST file and so on. Sometimes the user wants to access OST emails but can't be able to access OST email due to corruption. In the corporate world, most of the users are using the MS Outlook for the internal or external communication related to the business organization. This offline storage table is used to store all your mail items/folders in an offline mode on your system. So OST file is useful for those users who want to work in an offline mode where the network connection is not available. OST is the reduced form of Offline Storage Table of MS Outlook. OST File allows the users to work offline i.e. in the absence of Exchange Server and then synchronize the changes later when they connect with the Exchange Server. This unlimited benefit of OST files allows a user to work in Server downtime situations too. Sometimes OST file becomes inaccessible and in order to access OST file you need to move it in another file format. Since MS Outlook PST format is widely used file format which contains all the items like; inbox, outbox, calendars, contacts, sent items etc. 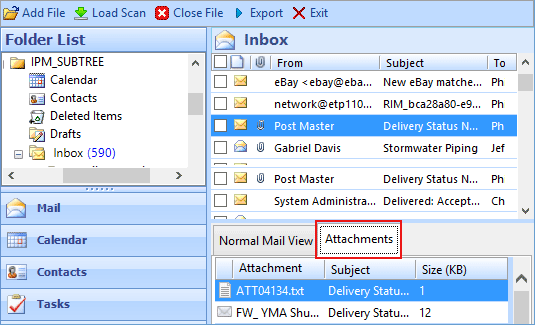 Hence it is advisable to move email with attachments into PST format. There are some manual solutions(export option of Outlook, archieve option of Outlook) which allows you to move OST email with attachments into MS Outlook. Open MS-Outlook browse and Click on File and then Import and Export. Then click on the Export button and select the PST file as destination path to move the OST email into PST file format. After that choose the destination path to move and store the PST file and click on the export button to continue the process. Collect the folder you want to Import and then check on Include Subfolders and lastly click on Finish. If you want to move OST email with attachments into MS Outlook within a few minutes then there is a standard tool to move OST file to PST file format i.e. OST File Mover. This is software having high-quality features to move OST file and save that file into the required file format. It provides the free trial version to move OST email with attachments. Software does not restricts you for file size. The user without having any technical knowledge will be able to use this software. This solution is an instant tool which works without Outlook and MS Exchange Server connectivity. One extraordinary feature of this software is that it recovers permanently deleted OST files within few clicks.